Architectural drawings inspired by regions of France, Italy and Spain were used to draw east Coasters to the hillside lots where their homes would be complete in time to avoid the next harsh winter. When originally built, the Hollywoodland sign had was comprised of individual letters 30 feet wide and 50 feet tall and constructed out of 3x9' metal squares rigged together with scaffolding. There was a 35' diameter dot below the sign with a perimeter of 20-watt lights to attract attention. The sign itself featured an addition 4,000 bulbs spaced 8 inches apart which blinked out "Holly", "wood", "land". As you can see from the old photo- it would have been hard to miss this landmark sign during the day but the lights would certainly have had a dramatic effect at night. Originally intended to be taken down after just 1.5 years, the sign has endured 80+ years in various states and become a true landmark for Hollywood and a symbol of all that it has to offer. Living in Hollywoodland defined living in the Hollywood Hills. As showy as the sign was, the developers managed to lay out homes in such a way as to create a small town charm. 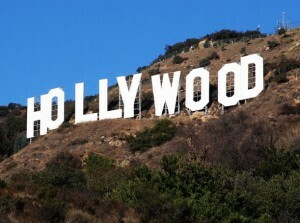 Hollywood Celebrities were drawn to the area then as they are now for the beauty, seclusion, views and great location. The proximity to the major studios is hard to beat. Many Hollywoodland homes have a fantasy feel to them. You'll find castles, Tudors and ivy-covered cottages right alongside Spanish and mid-century gems. Homes in the higher elevations have views over the canyon and city all the way to the ocean. Like many areas of Los Feliz and the Hollywood Hills, Beachwood Canyon and Hollywoodland are well-loved and have loyal homeowners keeping their famous neighborhood worthy of its place in history and the well known sign in its hills. The original stone gate still marks the entrance to the Hollywoodland community.